What is the Deal With In-Store Marketing? Should I participate in the marketing programs offered by retailers? Must I agree to retailer marketing BEFORE they will consider our products? What about the marketing we are doing outside of any retailer? Does that matter to retailers? All good questions and common ones, too. Often times, it seems the first hoop retailers will make you jump through is to sign up for their marketing programs. Even without having been awarded business first! In the past 2 months, I have prepared retailer marketing proposals (also known as shopper marketing) as the price of entry, or danced around conversations about this with ShopRite, Kings Market, Balducci's, Gelson's, Sam's Club and probably others that I can't think of. The irony is that the big guys, Walmart and Target, wait until after they award business before hitting up vendors for retailer marketing! Here are some answers to help you prepare for these conversations. 1. Why do retailers expect brands to participate in their marketing programs? Because it has proven to drive sales. That's the biggest reason. Time and again, marketing at the store level drives sales. Whether it is circular advertising, digital coupons, price promotions, mobile marketing, or in-store demos, they are effective at converting sales at shelf because they are super close to the point of purchase. Do retailers make money off these marketing programs? While I have never looked at the actual P&L of the marketing department, it is probably safe to assume that marketing programs generate some profit for retailers. But ultimately they do this to steal customers away from other retailers and drive traffic into their stores. 2. How does participating in retailer marketing benefit us? I'll reference my previous answer. Because it is proven to drive sales. The more sales generated at stores, the more inventory orders for your company. It is important, however, to make sure that for every $1.00 you invest in marketing, you get more than that $1.00 in return. You would be surprised how many vendors don't run the numbers before agreeing to retailer marketing. And even more vendors don't analyze the performance afterwards to ensure positive ROI. Then they agree to the same margin-erosive marketing programs time and again. Oy vey. 3. Which types of in-store/shopper marketing programs are best to do? It depends on your objective. Without turning this into Marketing 101, you need to first identify if your goal is to drive awareness, trial, repeat, multiple purchases, etc. Price promotions or temporary price reductions: It's great for incentivizing trial. If this is a shelf promotion, you're assuming that shoppers are already in this aisle and have found your product. Maybe they have seen your product before but for whatever reason did not buy. Price promotions capture shoppers who may have not purchased your product before because of a high retail price or unfamiliarity with your brand. The discount takes the risk out of trying a new product. It's best to run price promos - at minimum - once a quarter. If you run it too often, you run the risk of training the shopper to buy on promotion only. Think about the last time you bought anything full price at Banana Republic. (Does anyone still shop there?) Over time, it can dilute your brand reputation. The other downside is that you have to take a price cut too. With too many promotions, your profit margin will erode. Coupons: This is great for generating awareness and trial, especially if your coupon comes via mail or email or is downloadable from the retailer's website. Someone may stumble across your product for the first time while browsing coupons, and the discount will encourage them try your product. The coupon expiration date will create a sense of urgency and often times drive a trip to the store where the shopper will put other products in their carts. Just note the hidden costs of coupons. There is probably a fee to participate in the program, a fee per download, a fee per redemption, the cost of covering the markdown from the coupon. Oh yes, retailers want you to fund the coupon's discount! Print Ad/Circular: You're probably familiar with these if you grew up browsing the Sunday papers (ah, relics of the past!). Retailers often times have weekly circulars in print and on their website. Being featured in these circulars is a great and disruptive way to build brand awareness. You get tons of eyeballs on your product. And even better if you layer on a special price. Mobile marketing: Retailers are in the process of perfecting mobile marketing programs and offers. This is still a bit of the wild wild west. But it's unanimous, the shopping journey begins on mobile phones and it's important to intercept shoppers at this point. Target's mobile marketing program is a mobile app called Cartwheel. In theory, you can geo-target with mobile, but I'm not informed enough on this to know how that really plays out. Retailers are also rolling out iBeacon in stores. This is exciting but still not widely understood in terms of marketing effectiveness. You can read more about how to implement iBeacon marketing campaigns on this blog I found. In-store demos: If you've been in a Costco...EVER.... you know what these are. If you have a product that people love the instant they use it, sampling through in-store demos might be a good approach for you. It takes care of building brand awareness and sales conversion, often times without having to use a coupon. This is great for products that require a bit of education and for brands that are sold in select stores. Downside: it's not easily scaled since its labor intensive. Sponsored email announcements: This is exactly like what it sounds. Retailers will let you send out emails to their lists - often times dedicating the entire email to your brand. It's best paired with a digital coupon. It allows you to educate shoppers too with all that room to write informative copy. And while the click-through rates might be mediocre, it tends to be a great way to target customers. You can geo-target customers if you are only in a certain geography of stores. You can even segment your list by past purchase behavior and demographics. The fact you can target your list makes this a great marketing spend. Just watch out for the fees related to purchasing a list. They add up quickly. There are more retailer marketing programs available. But the above ones are most common and effective. The best one for your product or brand depends on your unique situation: Whether you are distributed full chain or select stores, whether your goal is to build awareness or trial (or both! ), whether shoppers already know where to find you in store, or if you just need to remind them that you're still around and to buy you again. 4. Does this mean I don't have to do any marketing outside of store? 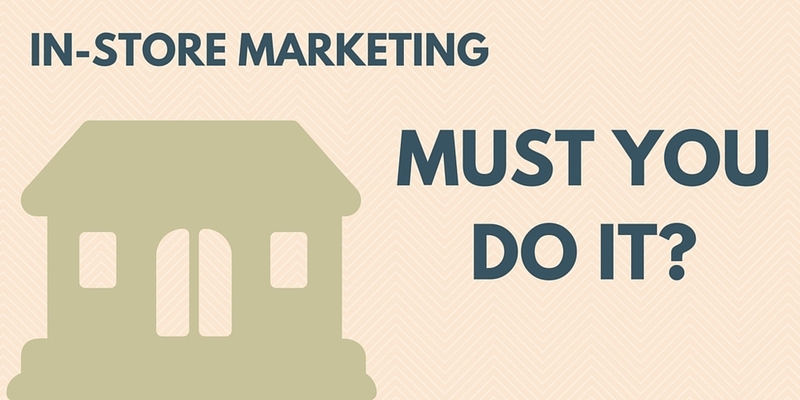 Doing retailer marketing alone is not enough. A great selling product will also have out-of-store marketing overlaid to help support that retailer marketing program. Whether it is Facebook ads, a blast to your email lists, social media bursts, sponsored blog posts, event marketing, display ads, print ads... you must implement tactics on your end to drive brand awareness outside of store and then use the retailer-specific programs to funnel that traffic into those specific stores. In-store and out-of-store marketing work together in harmony... and the harmony is the sound of the cash register ringing.